You may not know it, but the EasyCart is a very powerful system when it comes to getting taxation correct for your store. We offer six different ways to tax your customers, ways to allow users to be tax exempt, and all the tools you need to operate within the laws in your situation. For this article we will cover our largest customer bases (USA, Canada, EU, and Australia) and give tips on how to operate within the laws most easily. Businesses based in the USA have it easy, if you have a physical presence in a state, collect applicable local and state sales tax. If you have multiple physical locations in multiple states, then you must collect the tax applicable to each state that you have a physical presence. In addition, you only have to charge that sales tax to purchases that ship to states you plan to tax, for example: No need to tax someone from Arizona if your business is located in Washington. Lately we have had a lot of questions in regards to taxing each state you sell to, regardless of the location, but this is simply not true at this time. We happily point you to an article on the SBA’s website, which quickly confirms the small amount needed for most small businesses; to read more on this topic: https://www.sba.gov/content/collecting-sales-tax-over-internet. Setting up sales tax is simple for many operating in the USA (we will cover the exception next). Go to your WordPress admin and go to EasyCart Admin -> Store Admin -> Rates -> Manage Taxes to begin setting up. First select “Enable State Tax”, then, for each state you need to tax within, select the state and enter a tax rate (e.g. 8.5) and click save. As mentioned above, there is a small exception to the rule of thumb that tax in the USA is easy for online sales. If you have lots of physical locations across a state that has different local tax rules, you are theoretically supposed to charge a sale from each area in the state a different amount. Luckily, a wonderful tool is available and already integrated for use within the WP EasyCart, Tax Cloud! Tax Cloud allows you to setup a free account and establish the necessary tax rules by cities, counties, and states, making the process of taxing the correct amount easy! For more information on integration with Tax Cloud, we refer you to our docs on the topic: http://wpeasycart.com/docs/3.0.0/settings/advanced_options.php#taxcloud. Tax in Canada consists of GST, HST, and PST, which makes setting up slightly more complicated than setting up in the USA, but never-the-less a fairly simple process once you know which options to select. The first step is to go to the WordPress admin -> EasyCart admin -> Store Admin -> Rates -> Manage Tax Rates and enable the country tax system and add a 5.00% tax for Canada. Then move over and enable the state tax system and add the appropriate tax rates for each province/territory, if you are unsure of these rates, you can find the exact rates on http://en.wikipedia.org/wiki/Sales_taxes_in_Canada. We have now come to the most complicated taxation system around and because of this we offer the most options for our EU customers. Start by navigating to your WordPress Admin -> EasyCart Admin -> Store Admin -> Rates -> Manage Tax Rates. The first choice is do you want to charge VAT at a specific rate globally or different rates for each country. The latest VAT laws require you to charge VAT in the country that you ship to, so our recommendation is to go straight to the country to country rates. 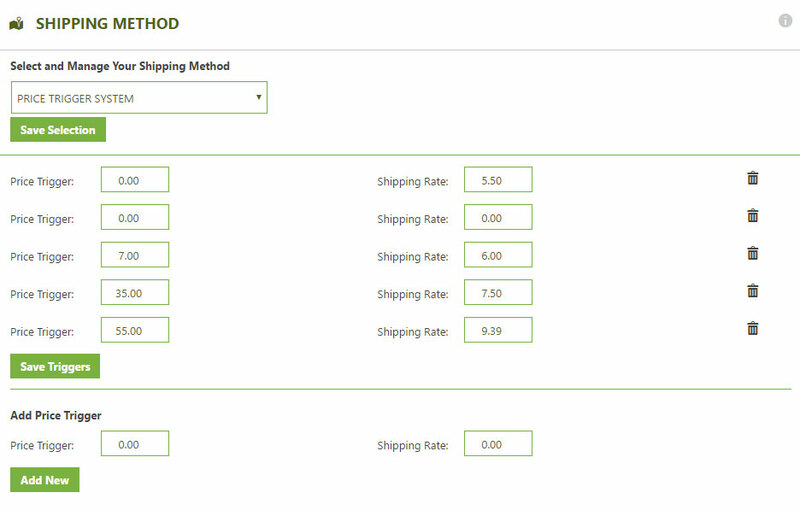 The next choice is between including VAT in the price of the product or adding VAT to the order totals during checkout and this varies from country to country so choose the method best for you, but if you choose to include VAT in the product pricing remember to set your pricing to include your countries base rate, the cart will adjust from there for each country. Now that you have the basics setup we should move to adding individual country rates. 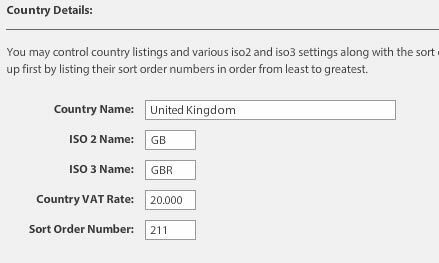 If you are on the screen shown above, click the set individual country rates button, otherwise navigate to EasyCart Admin -> Store Admin -> Settings -> Manage Country List and edit each country that you plan to sell to. A complete list of rates is available here: http://en.wikipedia.org/wiki/Tax_rates_of_Europe. At this point you should be taxing your customers correctly according to the EU rules, but in order to be in complete compliance you will need to do a few more things to really be ready to sell. The first requirement of 2015 is that you must require your customers to confirm that they are providing accurate information as to the shipping location. 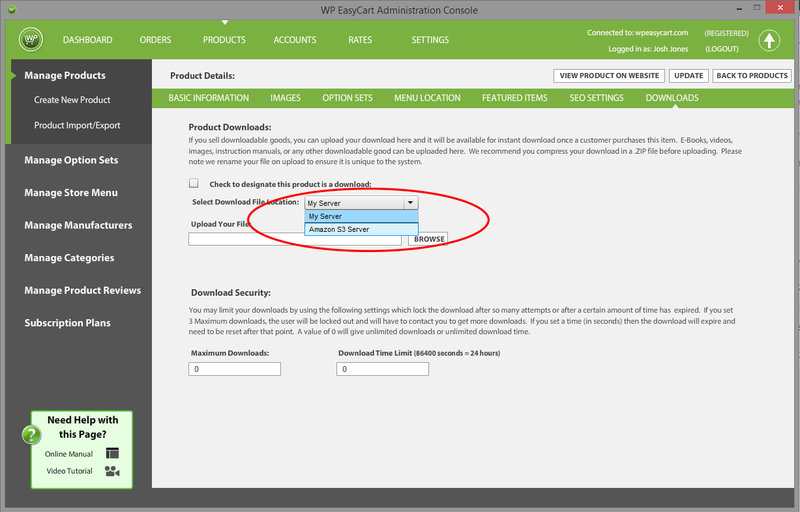 To do this, first turn on the requirement that the customer agree to your terms and conditions in the WordPress Admin -> EasyCart Admin -> Store Setup -> Basic Settings and in the cart section turn on “Require Terms Agreement”. You should also add links to your terms and conditions in the basic settings while you are there, which should be a separate page on your website. Edit the agreement text in the WordPress Admin -> EasyCart Admin -> Store Setup -> Advanced Language in the section “Cart – Payment Information”, edit the terms text to fit your specific requirements. The final thing to know is that you are required to collect and save evidence of the customer, including the purchaser’s IP Address and proof they agreed to your terms (which should now include information about how they agree they are shipping to the intended country, even if their IP Address is outside the country). We collect this for you and can be downloaded from the WordPress Admin -> EasyCart Admin -> Store Admin -> Orders -> Store Orders -> Export Orders. You will find this information at the far right of the downloaded excel file. By far the easiest setup is for Australia, go to your WordPress Admin -> EasyCart Admin -> Store Admin -> Rates -> Manage Tax Rates and enable VAT tax by country with VAT included at the product level and the VAT Rate a general 10% tax. Once you save this, set the individual country rates and set Australia to 10%. This should make your store compatible by law. To adjust the wording on the store and fix the VAT display to say GST, go to the WordPress Admin -> EasyCart Admin -> Store Setup -> Advanced Language and edit the content to switch VAT to GST. 1. Product taxation on/off – To turn tax on or off for each product, simply go into the advanced listing options while creating the product and check/uncheck the VAT option. 2. User Tax Exemption – You can allow specific users to be tax exempt by going to the user’s account in the store admin -> accounts area and check the “Exclude Taxes” box. 3. 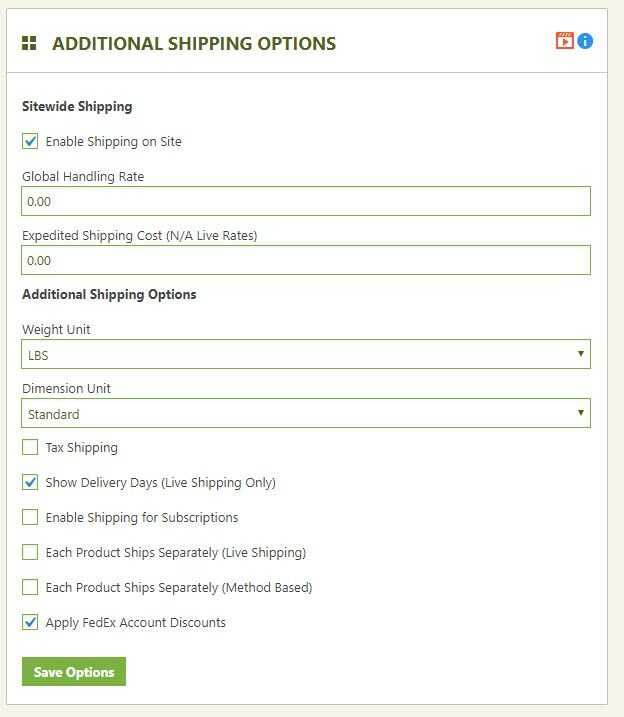 VAT included/excluded from shipping – By default, VAT is added to the total including shipping, to disable this option go to WordPress Admin -> EasyCart Admin -> Store Setup -> Advanced Options and turn on “No VAT For Shipping”. There are a lot of ways to sell goods these days, but EasyCart makes it easy with one location for all your retail goods, digital download goods, subscriptions and membership services and more. With digital downloads, you can easily sell products with little to no overhead other than building your content and product. Once it’s operational, your downloads can be sold with little to no interaction from you on your end. No packaging, no shipping, and no handling make this arena of e-commerce an attractive candidate for many businesses. There are a hundred+ e-commerce packages that can allow you to sell online digital downloads. After looking into many of these various software packages, some are expensive and can cost $1000+ to acquire licensing and setup. Other software packages are so limited that the management of the digital downloads is lost, tracking is lost, and the overall experience is not selling the digital download, but rather luring you into buying their software. 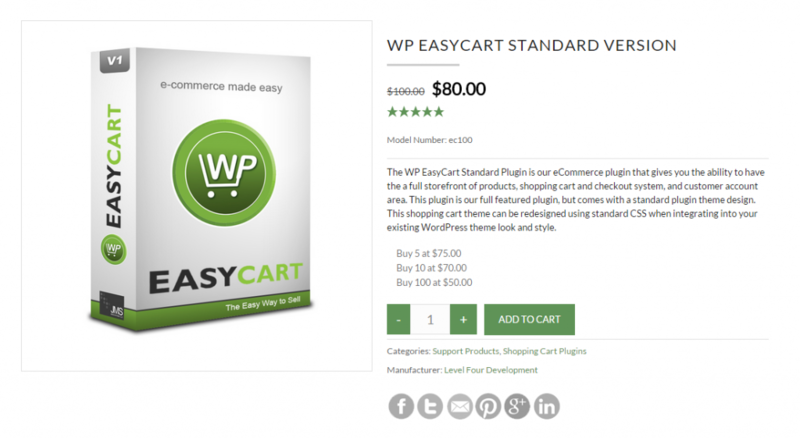 WP EasyCart tries to offer a low cost solution to WordPress store owners who want a powerful plugin, but also a low overhead cost. At only $80 dollars, the plugin is low cost for sure. Starting a business with an $80 dollar startup cost is extremely inexpensive, so you can quickly regain your costs with a few sales… Yet EasyCart offers a wide variety of methods to sell digital downloads. The easiest way EasyCart can sell downloads is to offer a single downloadable product that users can add to their shopping cart and checkout with. This process is very easy to setup in EasyCart, since you setup the product just like a normal retail good, with the exception of adding the download ZIP package or other digital file to the product. sell digital downloads with EasyCart! EasyCart takes care of the rest for you. 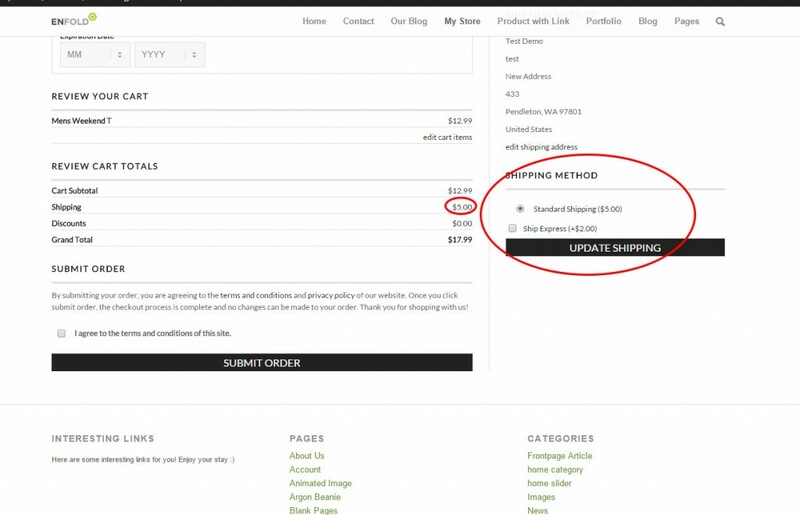 Customers add the product to their cart, they checkout and pay just like any other website. Once they purchase and the process is approved, the customer can access their account at any time to download their digital download. Be wary of plugins that send a download link, this is often a security issue and lets customers send out that link to friends and family to also jump on and download the exposed files. WP EasyCart also allows you to use Amazon S3 servers for storing digital content. If you sell large files or videos, simply use their servers and connect it to the product. This way the security and download processes are loaded on the Amazon S3 server instead of your hosted account. Select Amazon S3 to store and deliver digital content if needed. 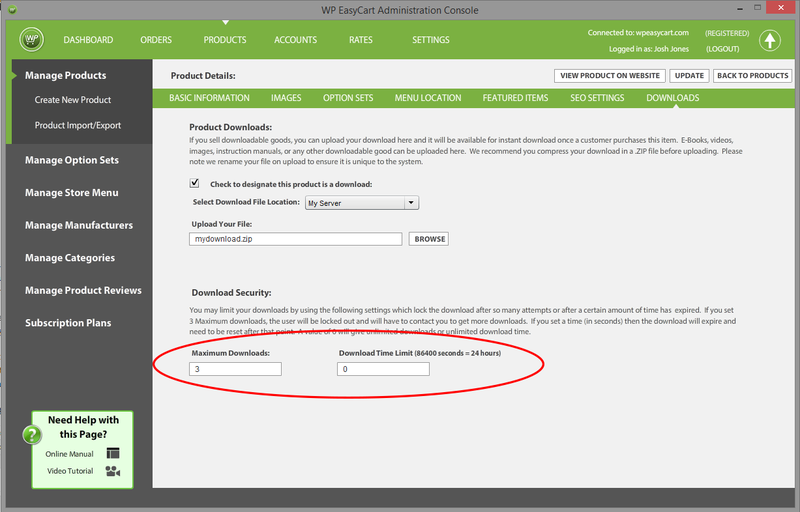 For extra security, EasyCart even gives you the option to limit how many times the download can be attempted OR a time limit, giving customers a week or so before the link in their account expires. This can also help curb customers sending out credentials to their accounts or passing links around to files… something many low cost plugins neglect to help eliminate. Add security to your download links! Another great feature EasyCart offers that many competitors do not offer is a subscription based system. For those selling digital downloads, it’s often a nice idea to offer a membership area on your website for subscribers to log into. This way you can offer more than just a link to a product, but actually offer multiple download links, descriptions of the products, forms for subscribers to use, video material, all from a single page. EasyCart includes ability to let customers subscribe and become members! 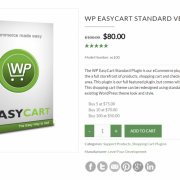 We even use this feature at WP EasyCart to sell our premium subscribers various WordPress themes, extra plugins that we build, and even access to our live chat systems. Whatever your needs are, the membership/subscription system is a great way to pass material to customers who pay. 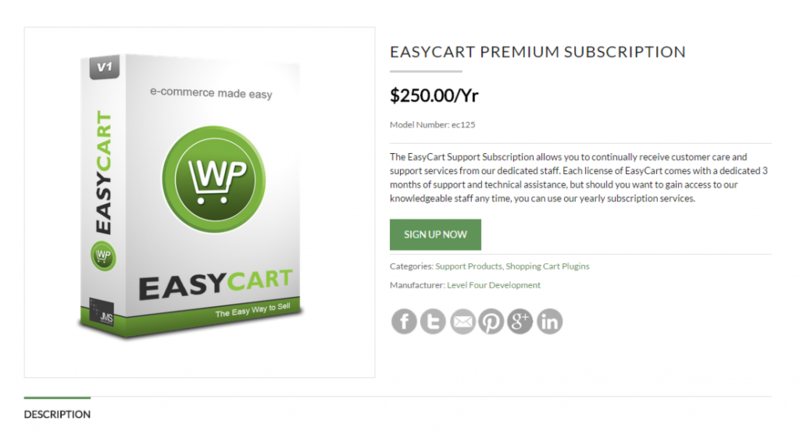 The WP EasyCart subscription system is easy to use, but can take some setup time. It utilizes the stripe.com payment processing system to link payments and subscriptions to an active system. Customers can then cancel memberships, upgrade/downgrade subscriptions, even update their credit information directly from EasyCart. This makes it easy for customers to maintain their accounts without the need to contact your support facilities. Once you are setup with stripe.com, you setup a subscription product and customers can ‘Sign-Up’ on the frontend. 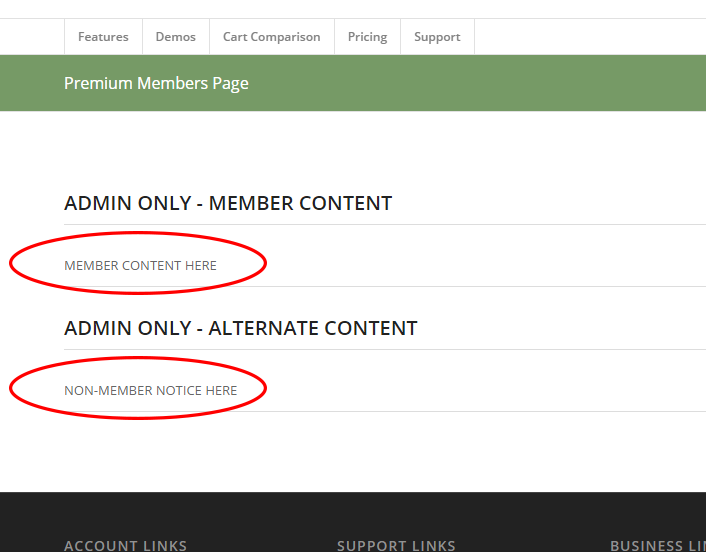 As for membership pages, that is even easier… just add our membership shortcode to a wordpress page and you can enter both ‘secured’ content and ‘unsecured’ content within the shortcodes. We usually add our membership secured content in the ‘secured’ area and links to signup or login in the ‘unsecured’ section. 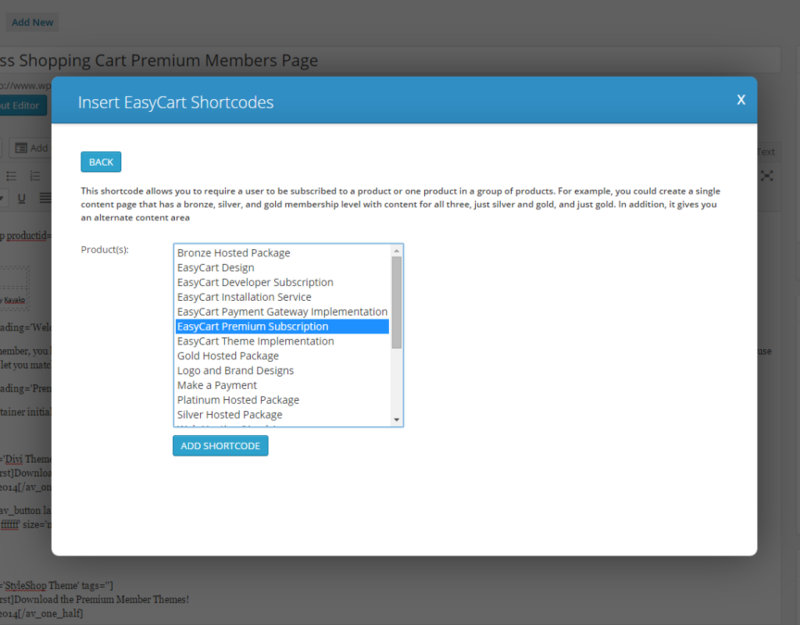 access easycart shortcode from WordPress page text editor! Create secured and non-secured membership content easily! Selling digital download and media doesn’t need to be complex. Once you understand the workflow of what it takes to sell and manage digital downloads for your customers, picking and choosing the software can be easy. EasyCart offers the flexibility and features to get your videos, music, sermons, pictures, and other digital downloads out to the masses. We here at WP EasyCart have been in the business of online selling and e-commerce for many years. And as a developer of a WordPress Shopping Cart system, we can tell you from experience we have seen it all. We have seen start-ups struggle in the e-commerce world, and sometimes failing, because of unrealistic expectations, poor planning, or sometimes the lack of knowledge in what is available. Often times a small tweak to what a business is doing can push them from struggle to success! So we thought we would release some helpful e-commerce tips for those looking to make their mark in the world wide web of online selling. It seems like common sense. It seems like something you have probably thought of already. But many online business sell goods and services that just don’t have demand. This is a hard question to answer, because deep down you know people want your goods, otherwise, you would not try to sell your goods online, right? But take a deeper look at how large that pool of customers might be and see if the risk to reward is there. Rule #2: Customer or Consumer? Do you know which is which? Who is your website going to target? Your customer might not always be the consumer, especially in the case of children. We have seen many website owners build websites for children, when the actual customer will always be the adult purchasing the item. Don’t confuse your consumers with the customers of your website. If they are going to be the same, then you can design as such a shopping system that treats them as one. If they are separate entities, be sure to cater to your online shoppers and customers in the shopping areas, while giving the consumers a good place to view and ‘Read-Up’ on your business. Often the consumer is the one influencing the customer to buy the product, so both need space and both need to be impressed with information and flow. Yes, you have a wealth of knowledge to give on your store, website, blog, and social sites… but resist! To much information is a turn-off for people visiting your site to look for goods and services. If you must have a lot of information, technical or otherwise, make sure the site flows well to that information, rather than smothering your home page with 10 pages of information because it’s important. Get a technical document repository somewhere in your site so IF people want to read it, they can. A good rule of thumb is to write your home page as you would like it with all the text, graphics, bulleted lists, etc… Then cut it in half! Be sure to analyze your market place competition. If you sell goods in a neighborhood brick and mortar store and are looking to go online, be sure to compare the two market places. You may have a complete monopoly on a local brick and mortar environment, but venture online, and you now compete against thousands of online shopping systems. Will you stand out? Will you have something unique to offer? There certainly are ways to do this. Will your loyal brick and mortar customers buy online? will they continue to walk into your store? So be realistic about your expectations when entering a larger arena like online commerce. It is fair to say you can pick up some revenue streams, but it may not be fair to say you will dominate like a brick and mortar might. Be objective and be clear what your goals are before you begin. The beauty of online shopping systems is you can analyze your traffic patterns much better than any other avenue of selling. Be sure to tap into the Analytics market and study where traffic is going on your new start-up site. Make sure you let traffic analysis run for several weeks before making decisions, then change one aspect and analyze again. It is a long and repetitive process, but making small adjustments and looking for results is the only way to accurately tune your website or online e-commerce system. In conclusion, be realistic, use good judgment, keep things simple, and analyze results periodically as you go forward in your new venture as a start-up. Remember, nobody is an expert at everything, so don’t let someone sell you that they are! We here at WP EasyCart try to follow our own rules as well, always rewriting, simplifying, analyzing, and adjusting to make the experience easier for customers and consumers. Getting your shipping pricing just right can be a tricky task. As your business grows and expands where you are shipping your products, so does the complexity of calculating a shipping cost. 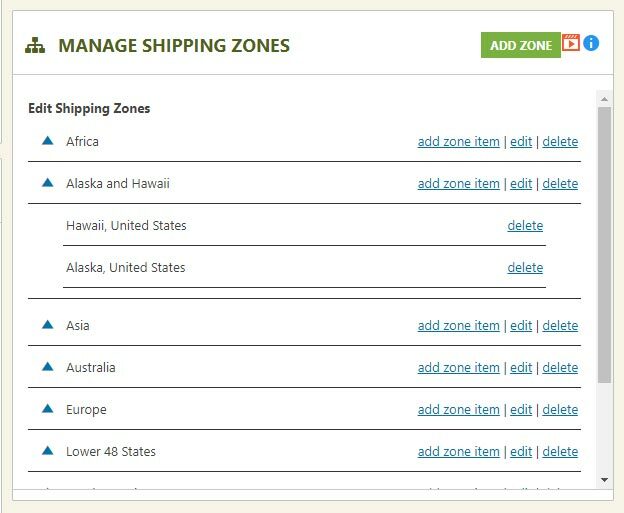 Here are a few tips to keep in mind when developing a shipping system that will work best for you. Many see the best results from live based rates through UPS, USPS, FedEx, and Australian Post. Keep in mind this may not apply to every one. If shipping rates tend to increase evenly based on weight, choose weight based shipping. If shipping rates tend to increase evenly based on price, choose price based shipping. 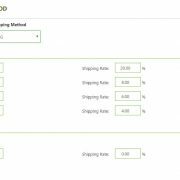 If a product tends to cost more to ship than all other products, use the additional handling charge option to adjust the shipping rate accordingly.